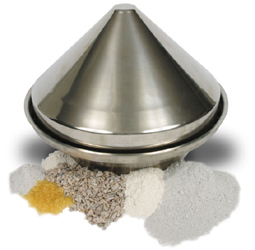 The ISL Cone Valve Technology works with elegance and simplicity and has no mechanisms or parts in the powder flow. There is no actuator to wear, abrade or fail and the system is fail safe. The ISL Transducer control system automatically varies the valve aperture, operating mode and product flow rates to ensure accurate continuous and batch control; irrespective of varying product characterisitics or even totally different products. The system is essentially maintenance free with only a handful of parts and assembly/dissasembly in seconds ensuring no downtime for cleaning or product changes. Valve type A - Flexivalve in one piece solid injection moulded elastomer with upper and lower flexible sealing edges for total stability and sealing. Valve type B - Flexivalve in one piece solid injection moulded elastomer with upper and lower flexible sealing edges for total stability and sealing; with removable vanes for activation of difficult products - in stainless steel graded 316. Valve type E - "Composite" cone valve in stainless steel as IBC, plastic outlet plug, and clamped edge seal. Valve type F - 450 diameter, spun, totally sanitary cone valve with band clamped valve body and lip seal; in stainless steel as IBC, Fits ISL system and old cone valve system as upgrade. Valve type G - 450 diameter, spun, totally sanitary cone valve with band clamped valve body and lip seal; in stainless steel as IBC, Fits ISL system and old cone valve system as upgrade. With "Halo" for the most difficult products.